Justice shares that it is time for your decision – investigate all the aspects of your situation, then decide what action is fair and honest. You have learned from your past experiences to do what you feel is best and all things considered – the right decision has been made. Balance and sound judgment are necessary now – a “complete” person needs more than “material” triumphs – the heart and spirit must also be served if you wish to produce justice. For every action, there is an equal reaction – weigh and balance your present conditions through elimination. Great inspiration is available if you tap into your “inner” source. Justice manifests itself through judgement and all who “think” judge. 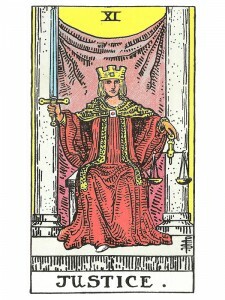 Justice represents “grace” or balanced judgement. Bliss or “heaven” is the state mind of a soul which is filled with hope – for it is the intensity of hope which gives the quality of “eternal”. Justice represents the balance of your “inner” works (prayer) – with your “outer” reality (thought) and freedom is experienced when you judge – not by your temperament or character – but, by the balanced justice or your own conscience. If you wish to progress – consider adjusting your beliefs and readjusting your behavior, maintain mental flexibility. New ideas follow patterns – you “judge” a new situation against an old recalled one and weigh your judgment based on that past experience in order to elicit what “you” consider a proper response. To properly understand your beliefs – you need to first interpret the “emotions” which are reflected from them, then “judge” which emotions are based on helpful beliefs and which are based on limiting, stressful ones. You will advance according to your ability to understand the past. You see the truth about yourself, by peeling off the outer masks and allowing yourself to perceive the “real” motivation behind the actions that you have taken and what would have been a more appropriate response. Be mindful, fair and honor your mind, your heart, your body and your spirit. “Memory/vision” is meaningful only if it produces an active response. “Act” upon the wisdom received from your “inner” self – for it pierces through the illusion of an event to find the deeper meaning of that event. You ARE the actions you have taken in the past and you form your future by the actions you take now. Real action – apposed to pointless movement – always brings meaning and value to your life, for such action comes from understanding. Awaken to the “active” principle or you will remain a passive machine – always pushed from one event to the next – never truly understanding what causes you to do the things you do. True action arises from self – knowledge and wisdom arises out of action. Think about your life if you wish to understand it – develop a clear vision of the truth. The Wheel of Fortune represents a vision of your life – the events, who you are and what you have made of yourself. Justice represents your understanding of that vision and understanding lies in accepting the responsibility for that life. If you believe that your life “just happens” – the past will remain a mystery and the future an endless turning wheel void of any real meaning, because you will constantly repeat past behavior. If you wish to change and control the “ego” mask you wear – you need to first admit that you created it – then you need to accept the “justice” of your life. What you are, you have made yourself – allow temperance to emerge. Initiation requires a response – if you choose to passively wait for the next event, you will not move forward. Ask questions! Seek answers to the mysteries that are being revealed to you and show your awareness of the process which is taking place and your willingness to move forward. Intuition links you to the greater powers of the universe. It is not enough just to foresee the future – if you wish to change or prevent an event, then you must first understand “why” it is coming, so that you can correct the “cause” within yourself – the things that you will do and the way that you will react. What happens to you, derives from the situations and the decisions you have made in the past – things work out the way they were “meant” to work out. Seeing the truth of an outcome in absolute honesty, will enable you to change or correct your actions in a future situation – by utilizing the lessons you are learning in this current situation. The fulcrum of the mind illuminated and educated. You KNOW what you know. A code of ethics, a basis for appropriate action – the rational mind balancing a host of dualities – giving equal time to both past and future. The mental link of dualities, non-violent concepts – balance without stagnation. Mental balance is peace. Knowledge of appropriate behavior – clarity, decisiveness – the mind has been touched by the heart, by the spirit. A working knowledge of the order of things, an intellectual understanding of what the game of life is, what the rules are and how you play. Organization, change for the better at the mental level. What decisions are you weighing? What consequences are you experiencing as a result of some previous action? What is the appropriate compensation or “energy exchange” needed to balance this situation? What do you need to do to be true to yourself? What can help create a new balance? In the first position: This lifetime will be dedicated to balancing views. It falls to you to work toward the reconciliation of opposing forces. In the second position: The balance you have achieved in your Physical/material Plane is a marvel to behold. Balance, as much as sheer quantity and mass – is fundamental to a good foundation. Your ability to judge situation and make correct decisions in business matters has not hurt. In the third position: The chakras are to be aligned for the work ahead – necessary alignment of the Spiritual, Mental, Emotional and Physical Planes. Hurry and get your seat on the correct side of the hall for the procession is about to begin. In the fourth position: The passion here, your guiding tape is for equality, for fairness and it grows up to be ideals like that of democracy in its purest form. The textbook heroic form of socialism in which all of God’s children are treated well. In the fifth position: Here is an opening of the throat chakra, with an attendant increase in communicative abilities. Your mind is centered, clear, decisive, and responsible, as it works to resolve a host of dualities. There is a Zen presence of mind. In the sixth position: Here is the effect of a leveling hand on relationships and creativity, productivity. Legal decisions affecting relationships in your favor. The Emotional Plane is making good sense. The heart is moving into more universal waters, caring about the effect of ethics and the lack thereof. In the seventh position: Trust your evaluations in the near future. Go with the facts – the truth. Legal resolutions in your favor. You have to make things add up before you can make much more headway. You may have to kill a sacred cow or two, but you will get those scales to balance. In the eighth position: Physical situation balanced, under control – peace – fairness all the way around. Favorable legal decision in your material plane. In the ninth position: The heart’s gut reactions are on target; trust your instincts here. The heart has noble concerns about egalitarian issues. Justice must prevail. In the tenth position: A mental calm washes over you. There is a pervading sense of correctness. Here is the answer to a mental conundrum. This sets the stage for your crusade. Your interpretation of this card helped me so much today. Thank you, Diana!